This course is about understanding humans and how they interact with computers. Designing the world with people in mind is the core idea of SIAT ("design technology as if humans mattered"). You will seek to understand human perceptual and cognitive abilities, how they support us when we interact with computers and computer-assisted artifacts, and finding better ways of designing these interactions to improve the overall effectiveness and user experience. You will engage in the process of interaction design (ID) or user experience design (UxD). You will be introduced to the fundamental components involved in interaction design, that is, designing human-computer interfaces from a human perspective as opposed to a technology-centered one. Details and further information can be found in the course syllabus on the course management system. Previous course project portfolio videos are available at here or diretly on youtube or vimeo. See below for a few sample videos. Visit http://sakai.sfu.ca/, login, then go to "iat201 Fall 2012" tab. Try the schedule tab for an overview on assignents and deliverables. This course follows the Interaction Design (ID) process closely. Projects roughly correlate with the different ID stages. We have colour-coded the stages to make clear which weeks and projects reflect which stages of the ID process. We will use this colour coding scheme consistently throughout the course, e.g. as with the navigation bar to the right. Click on the thumbnail to see a larger version of the ID process chart. IAT 201 - SFU ENROLLMENT SYSTEM from Bruce Lui on Vimeo. Treadmil, Flexdeck Shock Absorption System (Life Fitness 95Ti) Redesign from Adam Lin on Vimeo. IAT 201 Final Video (Sony Reader) from aaron|lalau on Vimeo. [IAT201] Miniclip Redesign from Kim on Vimeo. Final project video- 201- iTunes redesign from AlexandraFurman on Vimeo. IAT201 Snap.Colour.Pop! Video Prototype from Nathan Singh on Vimeo. What, why, so what? Understand course procedures and "big picture"
Understand weekly JiTT/Warmup exercises: Why do they support effective learning? What's required? Why care about learning/ memory/ cognition/ perception? Why understand humans/users? Understand big picture of HCI/ID: What is involved in the process of user-centred ID? We expect all to have read & understood the IAT 201 Course Syllabus and Understanding and Avoiding Plagiarism tutorial - We expect all students to be aware of this and behave accordingly! What is ID/UXD? Why care? What makes ID/UXD (in)effective? Understand/Explain key concepts: User experience, usability, utility, usablity heuristics. Examples? Perform heuristic evaluation. How? Why? When? (dis)advantages? Team project topics: What & how to choose? Analysis of good/bad design examples? Why (not) effectice? Brainstorm team project ideas. Schedule follow-up meeting to further discuss & decide on team project and post it on sakai to stake your claim. You should be re-designing and improving an existing ID device (computationally-based) that you have easy access to and ideally can bring to WS for showing/ testing/ discussing (no crappy interfaces! take a great one and improve it further! Prepare and bring notes/ a "cheat sheet" (1-2 pages of notes recommended) that you can effectively use in the workshop to do a simple heuristic evaluation (we suggest using Norman's heuristics, as described in the SharpPreeceRogers readings), analysis of user experience and usability goals (see readings); this will be used in team heuristics slam activity (and useful for exam preparation). What are components of ID/UXD process? What to do when and why and how? Why care about goals, questions, & hypotheses? How do you know your design "works"/what to improve and how? How did interfaces/HCI came about? What changed over time? Why? How to handle rapid & flexible demands? Ethics in research and ID: What to do/provide to satisfy the ethical standards? Dangers of not following ethical standards? Why hypothesis-testing in ID/UXD? How? Example? Form teams - ideally 5-6 people. No less than 4 and no more than 6 people/team. Discuss, revise, & finalize team contract. Bring paper copy to week 3 WS, sign it, then scan/photograph and submit as .pdf/.jpg to sakai. How to devise testable project goals, questions, and hypotheses? SWOT analysis (strengths, weaknesses, opportunitie, threats? Understand users? Design & run interview, questionnaire, observation? heuristics, project requirements/requirements specification, project goals, usability goals, user experience goals, user problems, design hypotheses, conceptual models: What are they? when used? Why/how? How different? Examples? e.g.,: difference between usability goals & user experience goals? 3 examples each? Functional vs. non-functional requirements? What's the difference? Examples? Heuristic evaluation: What? Why? How used? Drawbacks? Ability to perform one properly. Personas: What? Why? How used? “don’t test users, test hypotheses”: What are "design hypotheses"? How can hypothesis-testing be used in interaction design? Examples? Why might it make sense (benefits)? Why spend time & effort on ID1 “define” phase? Why spend time & effort on user research? Data gathering approaches: Explain; when to use what? why? how? Potential biases in user recruitment? Why care? How to avoid? prepare for small user study to gather needs and requirements. Talk-aloud user testing + subsequent interview/questionnaire might be easiest; for a great introduction to simple user testing, see e.g., “Rocket surgery made easy: the do-it-yourself guide to finding and fixing usability problems” (2010) by Steve Krug. (also available online through SFU library here). It contains checklist and scripts you can easily modify to suit your needs. How to develop alternative design and check if they meet the needs/requirements? Understand, contrast, and discuss different ID theories, models, & frameworks and their differences. Research methods (e.g. : contextual inquiry, user interview, surveys, journal/diary study, usability testing): Describe? How to use them? Advantages vs. drawbacks? Scenarios, sketches & models, storyboards, task flows/task analysis, wireframes: What are they? When/why/how used? Week 5 WS prep: Prepare ID1 presentation & draft report and submit to sakai "Assignment: ID1 Part 1: Team Presentation"). Bring laptop to WS. Presentation will run from submitted .pdf. Affinity Diagramming (aka KJ technique): Main idea & purpose? Rough procedure? Why prototyping in ID/UxD? How can prototypes be used effectively? For what purposes? Different prototyping approaches (e.g., vertical vs. horizontal) & fidelities (low vs. high): What/When/Why? How assessed? Pros/cons? Advantages/disadvantages of low vs. high fidelity prototyping? UngerChandler_Ch9: Transition from Defining to Designing (21p) [incl. ideation, visualization, story boarding, balance between business/user/development advocates, prioritization] Please read carefully, as the JiTT and next WS activity will be closely related to it. Learn & understand about human perception, cognition, learning, and memory and how they are fundamental for effective ID/UXD. How do we obtain and process information about the world? Apply this knowledge and understanding to ID examples and design, to analyze ID situations and critically evaluate them in oral and written discussions. Eventually, use these skills to hypothesize about more effective ID designs and design and create a simple ID prototype as the final course team project outcome. Vision: How do we see? How do we see color? Tricromat vs. opponent process theory? Implications for ID/UxD? Fovea, rods, cones: What are they? Implications? What is sensation vs. perception? Weber's Law: Explain, example, apply. Perceptual constancies: What is it? What is kept constant? Why/where relevant? Apparent visual motion: What is it? Examples? Where/why relevant for ID/UxD? What are top-down vs. bottom up-processes in visual perception? When/how used? Visual working memory: Capacity? Implications for ID? Visual queries: What are they? How used? Why care? How to design for effective visual queries? Distance/depth cues: Identify and explain different cues. Where/how applied in new media? Hearing: How do we hear? Similarities & differences between hearing & vision...? Continue developing conceptual designs A&B. Check the ID2-3 report template for details on what's required. Come prepared with two (2) conceptual designs. Check the ID2-3 report template for details on what's required. Bring prototyping materials: paper, sticky notes, scissors, tape, glue, string, markers, pencils, etc. How do human & environment relate and interact? What role does sensation/perception, attention, memory, cognition etc. play? Pop-out & visual distinctiveness: What can we easily see/find and why? What is "pop-out"? Why are certain things easy to see/find and others aren't? Examples? Underlying neuro-physiological mechanisms? Role of primary visual cortex? How can you test for pop-out? How to design such that several things can be easily searchable at the same time? Rods & cones: What they are, how distributed, what good for, implications for ID? What implications do color opponent theory and the relative distribution, sensitivity, and frequency of the three cone types have on our perception and (interaction) design guidelines? Week 9: 29. Oct. - 4. Nov. Perception, Memory: How do we get things into our brain? Ideation &mental imagery: How do we generate ideas and imagine new things, and why do we need a rapid production medium to be effective? Why is scribbling essential to thinking & design? Attention: scarce researouce --> how to design for it & guide Attention? 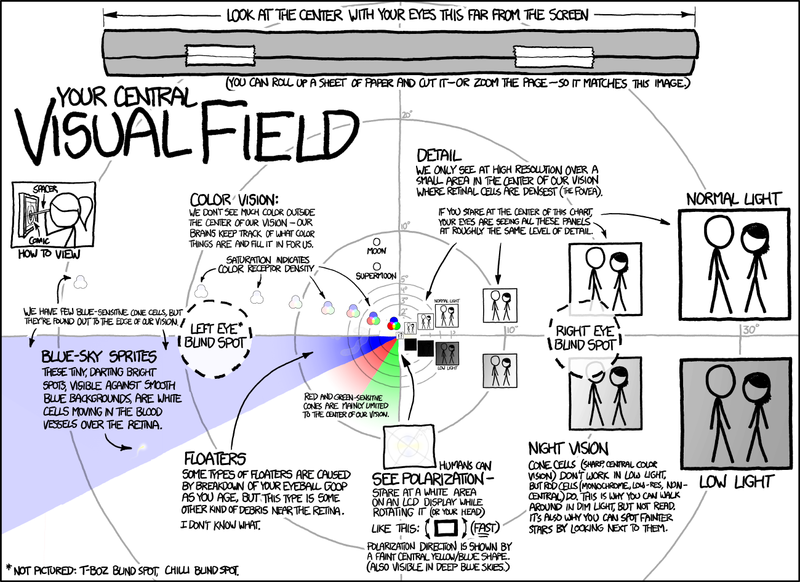 Depth/distance perception: How is depth perception different from sideways/up-down perception? Why? Implications for design? The power of sketching & line drawings: Why powerful tool in design? Why are simple line sketches so effective and flexible in conveying meaning and allowing for different interpretations? Underlying neuro-pysiological mechanisms? Creative design loop: imagination/imagery, rapid externalization (sketching), perception, interpretation and constructive critique (visual queries, visual/congnitive task analysis...), and iterative revision, refinement, extension, and consolidation: Explain basics, examples, implications, how/why useful, how to optimize it, skills necessary? C. Ware recommends designing to support visual search, visual queries, and pattern-finding: Explain, elaborate, examples, implications, how to do that & why? Underlying physiological mechanisms? How can designers facilitate/optimize this? What is meant by "recognition is easier than recall" in our context? Implications for ideation/prodotyping and ID? C. Ware talks about the concept of "cognitive economics of design sketching". Explain? Implications for designing/sketching? “Good design optimizes the visual thinking process” (p. 174): Elaborate & explain. examples, implications, how to do that & why? Underlying physiological mechanisms? 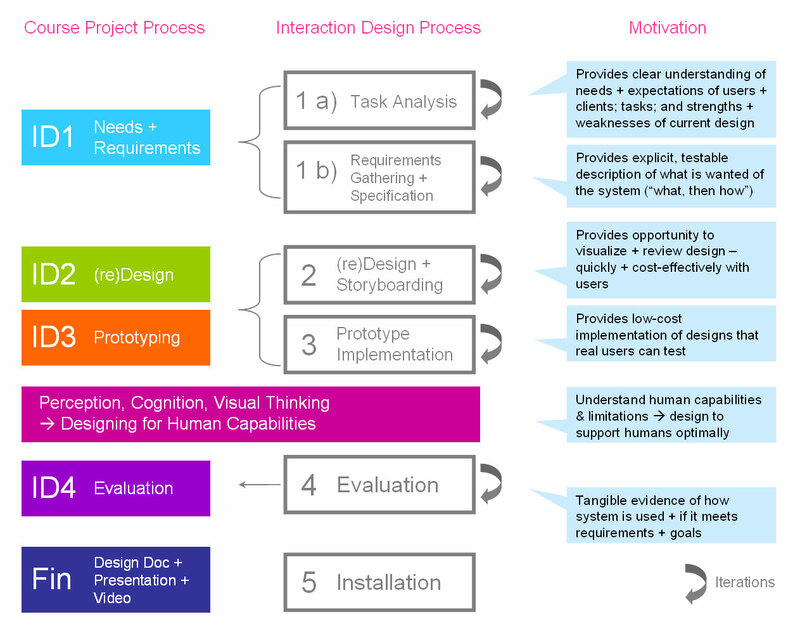 How can designers facilitate/optimize visual thinking process? Cognitive economics: What is it? How do cognitive economics (e.g., of sketching, recognition, recall, imagery...) affect the (interaction) design process? Implications and applications? Week 10: 5. - 11. Nov. Does it do the trick? How can you tell/prove? Being able to expalin and apply (Interaction) "Design as Hypothesis Testing"
Systematically desinging, conducting, analyzing, and writing up of a user study that combines quantitative and qualitative data gathering approaches. Analytical evaluation vs. usability testing: Description, examples, when used, what for, why, pros/cons...? Research approaches: (e.g., naturalistic observation/field studies, case studies, surveys, correlational resarch, experimental research, "scientific method", Qualitative vs. quantitative research approaches; basic vs. applied; descriptive vs. explanatory; field vs. laboratory research): compare & contrast, what good for, where are limits, benefits vs. drawbacks, examples, when to use what approach and why? For what situations/questions would you use what kind of research/evaluation approach? Why? Bias in running experiments with human participants: Possible sources of bias? How to reduce bias? Why? What experimental approaches are more prone to bias and why? Observer effect; single blind vs. double blind experimental design: Describe? Why important for ID/UxD user studies? Pilot user testing in WS, provide and receive feedback. Week 10 WS prep: Brainstorm ideas for ID4 evaluation study using the format and sections described in the ID4 report template and UC_Ch13: Design testing with users. Bring notes and UxDesign textbook to WS. Bring laptops. Bring your JiTT responses about quantitative vs. qualitative research approaches. Bring your two redesigned prototypes for pilot testing in the WS. Bring user testing plans and materials. Be prepared to pilot user testing in WS after 20min prep time. Week 11:12. - 18. Nov.
How to effectively present data? please fill out online anonymous course feedback survey. It's brief & should not take long, but we'll get your responses in time to improve the next offereing of IAT201. Thanks!! Why care about attention in ID? How can we "measure"/estimate attention in ID? What good for? How to design for attention? Automatic vs. controlled processing: Explanation? Examples? Implications & relevance for ID? When to design for what process? Why? Data presentation/visualization: How to design effective data presentations & visualizations? How not to lie with statistics/data plots? How do we sense, process, and store information? Sensory register, attention, Short term (aka working) memory, long term memory: What are they? Compare & contrast (e.g., purpose, strength/weaknesses, capacity, storage duration roughly, how/why forgotten?, why hard to retrieve)? How contributing to information processing? Week 11 WS prep: Collect all data, analyze, plot data, discuss, and prepare & submit ID4 team presentation (graded) and submit ID4 draft report (ungraded, but basis for chapter 4 of the final graded team report). See sakai "Assignment: ID4: Team Presentation" for details. Week 12:19. - 25. Nov. Final written exam in lecture on Nov. 22nd. It will likely take most of the lecture. The exam covers all material up to that point, with a bit more emphasis on the readings for week 7-9 (e.g., Colin Ware etc.). Some questions will likely be similar to previous JiTTs or questions mentioned in the lecture, the format and question style is very similar to the previous bonus pop quizzes. Please also check the "Key Concepts" when preparing for the exam - they pretty much define what you should know. More details are discussed in the lectures as usual. Note that we value understanding a LOT more than rote learning. Note: It's a closed book exam, with no cheat sheets etc. allowed. A Doctor's note is required for makeup exam (see syllabus rules; this makeup exam might be oral). please fill out online anonymous course feedback survey. It has only a few questions and should not take long, but we'll get your responses in time to improve the next offereing of IAT201. Thanks!! please fill out online anonymous course feedback survey. It has only 2 questions and should not take long, but we'll get your responses in time to improve the next offereing of IAT201. Thanks!! no more JiTTs & readings! Instead, more time to prepare for exam & project. This video showcase is the final graded team "presentation" (i.e., you show your video, followed by filling out the grading rubric), so please ensure that all team members can attend (no show -> 0 points) and are there on time. This is NOT optional. please hand in your final project video and portfolio CD on the day of the showcase, between 9-10am. We'll be sitting in the Mezzanine close to the Blenz Cafe with the presentation laptop. Make sure your video is uploaded to the presentation laptop and tested (!!) before .... do NOT give us an auto-play dvd. Make sure it's properly labeled and contains all required material - else we won't accept it. This event is open to the public - so feel free to invite friends & family. Week 12 WS follow-up activity: Incorporate ID4 feedback and submit written final project report (also included in final portfolio CD). Week 13 prep: Bring between 9-10am on Thursday Nov 29th: final project portfolio CD that includes: revised final project video, all prior reports, and ID2-3 video on CD labeled with team name & members, project title, and semester (iat201, fall 2012). See sakai "Assignment: Final project video & portfolio CD" for all the files that should be on the CD and futher instructions. Relax & enjoy the break! Thanks for all the great projects and project videos!